These boots come with a large range of features to make them excellently adapted for be worn for many hours and carrying out high levels of activity. To keep them looking polished and good as new, they synthetic leather and textile upper is welded with an abrasion resistant film around the perimeter. The boots come equipped with ClutchFit technology which wraps around your skin in a lightweight ‘second skin’ to give extra support and comfort. This focuses on the areas round the ankle, heel, and arch; the crucial areas for maximum support. They use DWR technology to repel water without adding to the weight (although it is not fully water proof, just water resistant). To provide extra comfort, especially when jumping the full length Micro G foam cushions your landings and allows for powerful take-offs. The boots are lace up and because of the padding, are able to keep your feet very warm, even though cold winters. They are of height approximately 17.5 cm and are carefully designed so that they mould to the individual feet of the wearer providing maximum comfort. The boots themselves are very lightweight and are not heavy for your feet. This does mean they are not adequately suited for really high intensity heavy work, but they work well for high physical intensity jobs. There is no dispute that these boots both look and feel amazing while you wear them, no doubt down to the vast amount of padding and cushioning foam. However, there is a major issue with their durability which throws into concern the price you pay for the boots and the length of time they actually will last you for. After just a few months of use, the sole and shoot often start to detach from one another and the soles are prone to wear down quickly. Military – These grippy and sturdy boots provide maximum comfort and a high level of support for your feet, meaning they are optimum for fast moving, physically intense jobs. Complete with a slip resistant rubber sole, they give excellent stability, allowing you to move swiftly over uneven terrain. Law Enforcement – Again, these boots provide comfortable, sport boots that allow for high level of physical exercise to be carried out without causing damage to the wearer’s feet. Patrol / Guard – These boots are excellent for low physical intensity jobs that involve standing around as they are very comfortable and will take longer to wear out than if you are carrying out high level physical exercise. Everyday – Because of the high level of comfort, these boots can easily be worn for hours on end, without causing any discomfort to the feet. This is because of the high level of padding and cushioning technology contained in the boot. They have a slip resistant rubber sole, which keeps you steady even in the slippiest of conditions and the high level of insulation. 2After buying these boots, you get the impression that they are more shoes than boots. 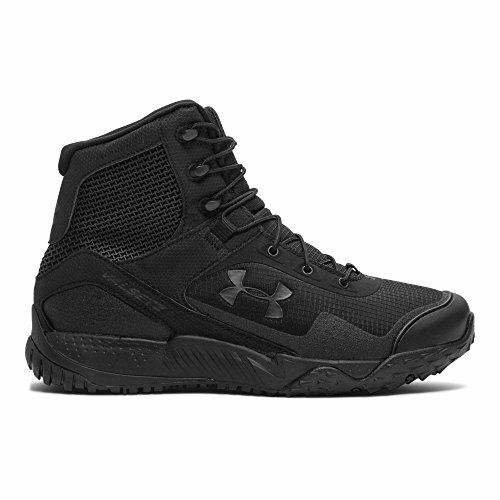 They can almost be viewed as more gym shoes than tactical boots and yet, on the plus side, they are extremely lightweight and comfortable for the feet. 3You should take care to order a slightly bigger size if you have wide feet as if not you may end up with painful blisters on the sides of your feet as they were clearly designed with more narrow feet in mind. They are water resistant, but not waterproof. They should faire you well through casual rain but in really wet conditions, they won’t keep your feet dry. No, they aren’t and are not at all suitable for dangerous work involving heavy machinery or sharp objects. Do these boots have good grip on concrete? Yes, they have an excellent grip on concrete, keeping you very stable. Yes, they are fairly accurate and true to size, although if you have fairly wide feet, I’d take care when buying them.